Stay in Regency Lagoon for as low as Php107.78 a day on installment basis at 0% interest! 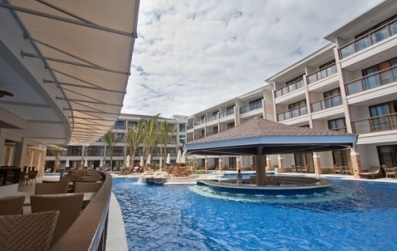 Stay in Regency Lagoon for only Php107.78/day! Enjoy the longest beach front area on the island's famous white beach via 1 minute transfers or a 3 minute walk to sister resort Boracay Regency. An unmatched feature at Regency Lagoon is it's 1,200 square meter lagoon-swimming pool, the biggest in the island. Visible from all rooms, the lagoon is the guest's private retreat if they find the long beach too crowded. With sun-loungers made of teak-wood and a pool bar offering refreshments, the lagoon will truly become one of the highlights of your stay. With over 120 world-class guest rooms with a minimum area of ** square meters spread over five 4-storey buildings surrounding the resort's 1,200 square meter lagoon-swimming pool. All rooms feature a balcony overlooking the resort's majestic lagoon, and luxurious amenities such as 300-thread count duvets, LCD TVs, individually-controlled airconditioning, and resort toiletries. Click here to return from Boracay Regency Lagoon Travel Package to Boracay Packages.